I should start this review by saying I’m not the world’s biggest fan of The Punisher in any medium, comic books or movies. Mention the Punisher movie starring Dolph Lundgren to Punisher fans and you might get a serious beatdown in return. Not that it was a bad movie. In fact, The Dolph Lundgren Punisher was a good little action/revenge movie in its own right. It just wasn’t The Punisher. In comic books the character is maddeningly inconsistent. When teaming up with Spider-Man or Daredevil, he’ll use rubber bullets and tasers to incapacitate his enemies whereas in his own books (at one point there was no less than three separate Punisher titles as well as numerous graphic novels and mini-series) he racks up a seriously impressive body count, ruthlessly blowing his enemies away without taking so much as a coffee break. So you’ll not be surprised when I say that any movie version of THE PUNISHER isn’t one that I was waiting for my whole life. But it surprised me by being far better than it had to be. 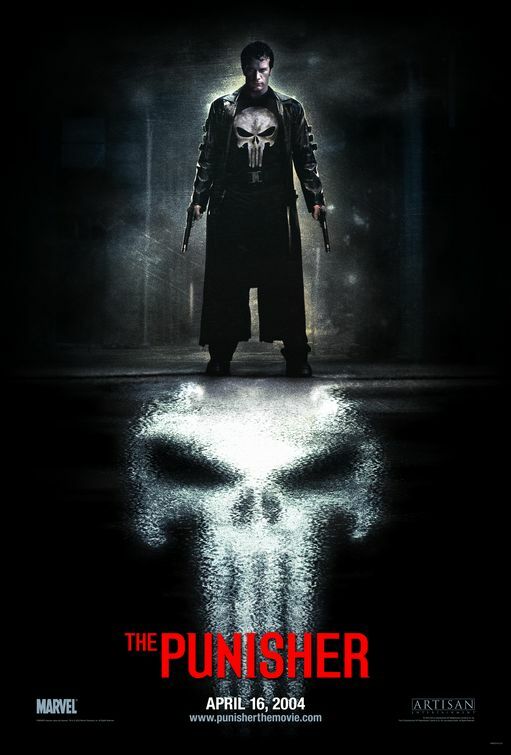 Frank Castle (Thomas Jane) is an undercover FBI agent whose last case is an illegal weapons deal sting operation. Frank’s death is faked during the sting but Bobby Saint; the son of businessman/drug money launderer Howard Saint (John Travolta) isn’t so lucky. He actually is killed and Saint directs his right hand man and enforcer Quentin Glass (Will Patton) to find out who was responsible for his son’s death. Glass finds out Frank is still alive and while Saint would be satisfied with just having Frank killed, his wife isn’t so forgiving and demands that Frank’s entire family be exterminated. As it happens, Frank is attending a family reunion in Puerto Rico which makes it really convenient for Glass and his hit squad to massacre the entire Castle family including Frank’s dad (Roy Schneider) as well as Frank’s wife Maria (Samantha Mathis) and his son William (Marcus Johns) despite Frank’s heroic efforts to stop the slaughter. Frank himself is stabbed, beaten to a pulp, shot numerous times, doused with gasoline, nearly incinerated, blown off a fiery dock and damn near drowned. It was at this point in the movie that I muttered; “Who’s doin’ the punishin’ ‘round here? During this ten -minute sequence Frank Castle suffers more physical trauma than most heroes in entire two-hour movies. Your obligatory mysterious shaman who lives alone on some island by himself presumably nurses Frank back to health. I say presumably because Frank is found by the old black guy floating in the water and the next scene has Frank and the old guy returning to Frank’s dad’s house. Since Frank has a full beard I surmise that some time has passed but there’s no real explanation given. But apparently the old black guy has medical skills and resources that would wring gasps of envy from an entire New York City hospital emergency room staff since he was able to keep Frank alive after his massive injuries which included a 9mm bullet through the chest at point blank range. THE PUNISHER has a lot of good things going for it. Thomas Jane certainly looks like the character from the comic books but in a lot of scenes he looked so much like Christopher Lambert I almost expected to hear him say; “There can be only one” during his final confrontation with Saint. 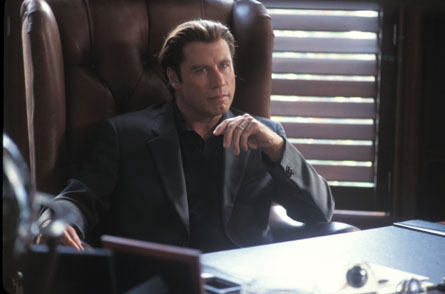 And John Travolta does his usual highly watchable and professional work. He’s played better bad guys before but he does a really good job here. Unlike most movies of this type there’s a genuine effort to give the bad guy recognizable and understandable human motivations for what he does. There’s a scene between Travolta and Will Patton near the end that’s so dramatic and so well acted that it seems like it’s been spliced in from another movie altogether. There’s a fight between Frank and a freakishly super strong assassin called ‘The Russian’ that’s suspenseful, well-done, very brutal and even funny at times but was lifted from the James Bond movie “Never Say Never Again” and some of the scenes with three eccentric neighbors of Frank’s, played by Ben Foster, John Pinette and Rebecca Romijn are amusing and I suppose they help to lighten the mood of what would otherwise be a downright depressing story. I also liked that the movie didn’t skimp on the violence level. I mean, the character of The Punisher is a violent one and in this movie we really get to understand why Frank Castle goes off the deep end. There’s something like 50 members of his family at the reunion and nobody is left alive except for him. The character’s pain and loss is portrayed in such a way that his rage is totally understandable. The plot holes in the story are obvious and some actually made me shake my head in dismay such as the scene where Frank shows up alive and well on the steps of City Hall at a press conference and confronts his old FBI buddy and the Tampa police commissioner and demands to know why there has been no arrests of Saint or his men. First off, why would the Tampa police be investigating crimes committed in Puerto Rico and second, a former FBI agent’s family is wiped out, he himself is presumed dead but turns up alive and well and he’s just allowed to walk around without being interrogated as to where the hell he’s been all this time or placed in protective custody? So should you see THE PUNISHER? If you’re a fan of the character I certainly think you’ll enjoy this. It’s more faithful to the comic book and it’s certainly well acted by everybody concerned, especially Thomas Jane, John Travolta and Will Patton. THE PUNISHER isn’t a superhero movie that I’d say you absolutely have to see but it certainly won’t hurt if you do. I think the biggest problem with this movie was the writing. 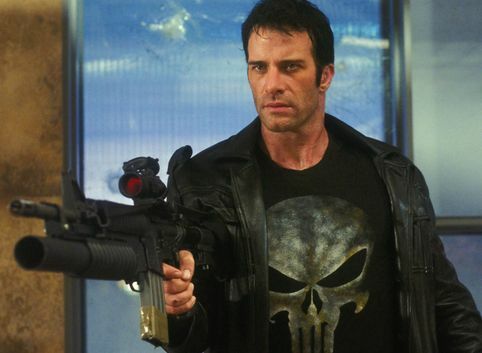 One thing I thought The Punisher: War Zone got right is that it kept Frank’s backstory simple — he’s ex-military, he’s well-trained, his wife and children were brutally murdered in a senseless act of violence. Five minutes, maybe less, and that’s all you need to know about his backstory. I guess the filmmakers felt, like most superhero movies that were making the most money at the time, we needed an origin story that took up about a third of the film. I’ve read a lot of complaints about Travolta and Jane’s performances and for the life of me, I don’t understand what those people are smoking. They do a great job. And Jane is perfect for Frank Castle, he just needs a better script to work with.